We believe that the Creative Enterprise Programme is an exciting and unique learning experience for our diverse participants and stakeholders around the globe. We hope that this evaluation, retrospective and on going, captures our passion for the creative industries, our desire to improve the livelihoods for creative entrepreneurs in countries where access to support is limited, and empowers us to continually improve our offering. Since 2006 the British Council Creative Economy team has partnered with UK innovation charity Nesta to deliver the Creative Enterprise Programme around the world - face to face workshops aimed at giving new creative entrepreneurs the skills and confidence to launch their own creative businesses. Developed by Nesta, and delivered in partnership with the British Council, the programme is aimed at people who are soon to launch a creative business or have been trading as a creative business for less than two years. In 2016, the programme underwent a major refresh based on recommendations and feedback of a previous programme evaluation, to increase compatibility with wider regional and local creative economy agendas, generate longer term impact, and build lasting legacy. We embarked on a global roll out and responded to a variety of challenges in different regions. Since the refresh, Creative Enterprise Programme has taken place in 25 cities in 15 countries, in six languages, to more than 750 creative entrepreneurs. It has been delivered in a variety of ways, from light touch delivery to a long term embedded approach. 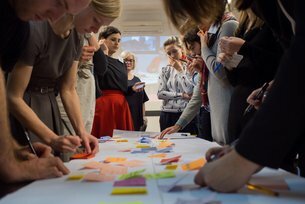 We are looking for an experienced evaluator to develop and conduct a retrospective evaluation of the refreshed model of the programme to demonstrate impact and return on investment for the British Council, Nesta, wider partners and local stakeholders. In addition to this, the evaluator will work with and support us to design and implement a robust long term methodology, logic model and longitudinal evaluation framework. The objective is to help us better understand what the needs and opportunities are for the programme and thecommunities we work with, which will help us to work towards legacy and long-term sustainability. a detailed proposed budget and costs, including a break-down of cost per phase / deliverable and the hourly rates and anticipated number of hours involved in conducting the project. The available budget for this work is between £30,000 and £35,000 including VAT, interview expenses, travel costs and all other out of pocket expenses. The contract is for 12 months initially, with future work subject to funding. For further information and guidance please read the request for proposal, FAQ’s and previous evaluation report. The deadline for submission is Monday 16 April 12:00 GMT. For clarification questions, please contact nikki.locke@britishcouncil.org. Please email proposals to emma.boulton@britishcouncil.org.